Wow, is it already February?! How did that happen? Are you off to a fabulous start of 2018? Or are you as mystified as I am, that we’re already into February and you haven’t clarified your goals or vision for the new year as much you’d like? I love January because it represents a clean slate. It’s an opportunity to reset, recommit and re-energize around fresh goals, priorities and possibilities. I love the rituals of completing one year, and clarifying intentions and energetically aligning with an inspiring vision. How about you? AND, January is also often a more stressful and overwhelming month for many. I call it the “December hangover.” The holidays and time off, shopping and extra commitments, extended family and travel can be super fun but also draining, throwing your flow off balance. Then, comes the tidal wave of new projects, neglected to-do’s and more. Our kids were off for 17 days throughout the holidays, and we had a blast. We savored the holiday lights, playing games, and experimenting with the new keyboard Santa brought us. Seems like eons ago now. We spent 10 adventurous days in the serene mountains of North Carolina visiting “Pop and Oma.” The kids got to experience 16 degree cold weather, play in the snow and build gingerbread houses. And they skied for the very first time! Fun! Fun! There was a lot to catch up on after our time away. And just when my time freed up, my husband’s company needed my assistance, pushing some of my own priorities, including this ezine…aside. But, it has been super fulfilling to jump in and contribute in a myriad of ways. This is how life ebbs and flows, right? Sometimes our time gets hijacked. We prioritize. We make choices. Ultimately, life is about surrendering to the moment, taking things “one at a time” and….. beginning again. Right? During a ropes course exercise years ago, we were tasked with a challenge. Getting each team member through a web of knotted ropes, without touching the rope at all. The openings weren’t very big, and there were 20 of us. And no one could go through the same opening more than twice. It has been a “go to” phrase of mine now for 19 years. No matter where you are, how much momentum you have or don’t have in any given moment, you can always, “Begin again.” You don’t have to wait for a new year, new month, new week or new day. Only a new moment. There is no judgment, no drama, no shaming with “Begin again.” The tone of the facilitator, which we heard countless times during that exercise, was so matter of fact, so neutral, so okay with our infraction. We just had to “begin again.” No big deal. We just kept “beginning again…” until we accomplished our goal. By the way, what ultimately allowed us to complete this seemingly impossible task was the entire group becoming deeply connected, present and in tune with each other, finding a focused, yet relaxed flow. Once again, you could say “inner peace” created the magic. I like to end my year with a “End of Year Completion” ritual. Typically I do this on or around December 31st, but “Shhhhhhhhh…. I haven’t done it yet this year.” Instead of pretending I lead the perfect life, I’m just going to be honest… without shaming myself. Just because it wasn’t done in December or January, doesn’t mean it’s too late to do now. 1. End of Year Completion. Here’s a LINK to the 5 End of Year Completion questions. I encourage you to set aside an afternoon or evening and take inventory of 2017, if you haven’t already. 2. Visioning. What is your vision for 2018? Here’s an article I wrote recently about creating a 12 month vision. Clarity is power. And aligning yourself emotionally and energetically is even more powerful. 3. Top 25 Goals. Even for the busiest, taking time to clarify and claim your top 25 Goals for 2018 is a must. If you’ve already done this, congratulations! How are you doing so far? If you haven’t done this, or are like me and need to put some polishing touches on the list, make a date with yourself and do it! Or grab your partner or a friend, and do it together to inspire each other and hold yourselves accountable. Last year, my husband and I got a babysitter, went to Monarch Bay Beach Resort (a fancy pants hotel near us), to solidify our intentions and goals. We sat by a fire with our journals and a glass of wine, and talked about what was most important in our new year. We energized those goals with clarity. Definitely, well worth the investment in your life. Your health and fitness routines? Finding your inner peace when triggered, overwhelmed or grumpy? Writing a book or other creative endeavor? Attacking your list of tolerations? Eating super healthy and nutritious meals? Those reading those 3 books on your nightstand? 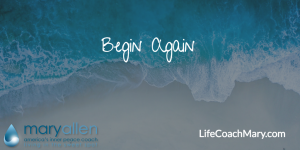 Where do you need to begin again? I don’t know anyone who never has to reset, recommit, or restart something important. No judgment. No drama. No guilt.